Outside the Capulet tomb, Paris mourns. He sends his servant away to wait for him nearby, and tells the boy to whistle if anyone approaches. While Paris strews the ground with flowers, the page whistles. Paris hides. Though Paris is little more than a good-looking bore, his love for Juliet is real. Romeo enters bearing a torch, with Balthasar following him. Romeo gives Balthasar a letter and instructs him to give it to his father (Montague) the next morning. He says he wants to see Juliet one last time, and to take a ring from her as a remembrance, and sends Balthasar away. But Balthasar doesn't leave, and instead hides nearby. Romeo lies to Balthasar about his plans—once again he uses deceiving language as a way to gain privacy from the social world. Paris recognizes Romeo and thinks he has come to desecrate Tybalt's or Juliet's grave, or both. He draws his sword and confronts Romeo. Romeo begs Paris not to try to stop him, but Paris refuses. They fight. Paris's page runs to call the Watch. Romeo kills Paris, but promises to grant Paris's dying request to be laid to rest near Juliet. 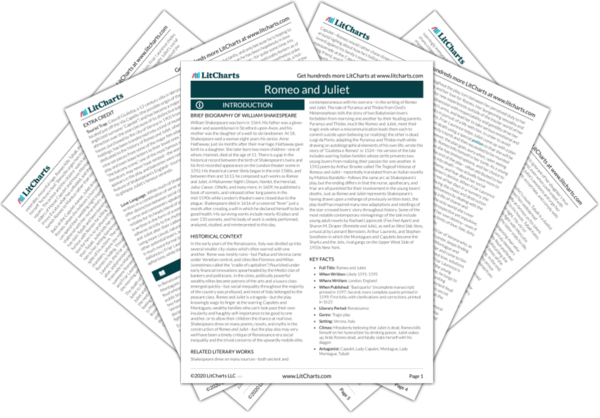 Paris throws flowers on his love's grave, while Romeo has come to kill himself–Romeo vs. Paris pits passionate love against a more "proper" love. It's no surprise who wins their duel. Romeo opens the tomb and carries the body of Paris inside. He sees Juliet, and is amazed that her beauty is unaffected by death. He thinks it seems almost as if death has fallen in love with her. He kisses Juliet, drinks the poison, kisses her once more, and dies. 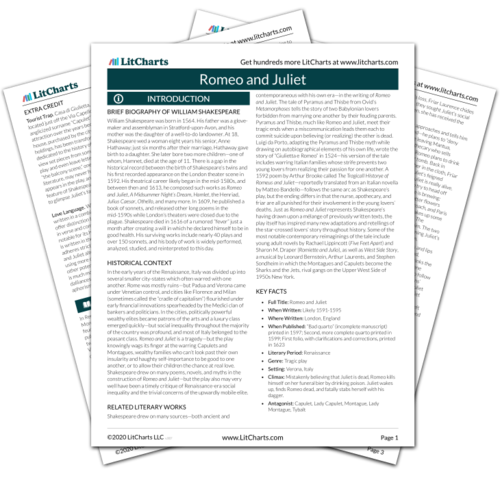 Romeo fulfills both fate and love, and removes himself from the social world—he kills himself to be with Juliet. Note also that the dark tomb provides a kind of permanent night. Friar Laurence arrives at the churchyard and is greeted by Balthasar, who tells him that Romeo has returned to see Juliet. The Friar, sensing disaster, rushes to the tomb and sees the blood and weapons from Romeo's fight with Paris. Just as he enters the tomb, Juliet stirs and wakes. Friar Laurence hears the approaching Watch. He tells her what happened, and begs Juliet to flee with him. Juliet refuses. Friar Laurence runs. By fleeing, the Friar shows that his moderation, while usually the wiser course than passion, is often not as honorable, pure, or courageous as passion can be. Juliet sees the vial clutched in Romeo's dead hand and realizes he killed himself by poison. She kisses his lips, hoping to poison herself. But there is none left. She hears the Watch approaching, pulls Romeo's dagger from its sheath, stabs herself, and dies. Juliet kills herself, fulfilling her fate, when she hears the approaching watch–a symbolic playing out of death as a form of privacy from encroaching society. The Watchmen enter and see the dead bodies. They send men to rouse Prince Escalus, the Capulets, and the Montagues, and search the area. They find Balthasar and Friar Laurence. The social world discovers what has been going on in the private world. Prince Escalus enters, followed first by the Capulets, and then by Montague, who says his wife has died of grief over Romeo's banishment. Friar Laurence explains to them everything that happened. Balthasar hands over the letter from Romeo to his father, which corroborates Friar Laurence's story. The Prince turns to the Montagues and Capulets and tells them that their hate is so terrible that "heaven finds means to kill your joys with love" (5.2.292). Montague and Capulet take each other's hands, promising to bury their grudge and to erect golden statues of Juliet and Romeo. Prince Escalus, mourning his own dead relatives, leads the group away. Romeo and Juliet's love is so passionate that it has to be everything or nothing, and in a world of families, friendships, and civil law, love can't be everything. So their love demanded that they die. In other words, their love was their fate. And by killing themselves, Romeo and Juliet change the world in a way their word play and lies couldn't:—they end the feud that made their love impossible. Fate may have ended their lives, but it also made their love powerful. Florman, Ben. "Romeo and Juliet Act 5, scene 3." LitCharts. LitCharts LLC, 22 Jul 2013. Web. 18 Apr 2019. Florman, Ben. "Romeo and Juliet Act 5, scene 3." LitCharts LLC, July 22, 2013. Retrieved April 18, 2019. https://www.litcharts.com/lit/romeo-and-juliet/act-5-scene-3.